Microsoft's new Kinect device will put an advanced sensor array in the living room of millions of people, an Internet-connected set of machine ears and eyes capable of capturing voice, recognizing faces and tracking body movement. Don't worry, the company says, we won't peep. "By default we don't listen or look at anything," MIcrosoft's director of the Kinect technology, Alex Kipman, told Kotaku in a recent interview. "No data is ever sent back to Microsoft. Period. Full stop." The topic of privacy didn't surprise Kipman, and it shouldn't. Privacy has long been a concern in society and people are often wary of new technology that may peer into their homes. Not always, of course. But just as people may overshare personal information on Facebook or through location-identifying services lik Foursquare, they do sound alarms about airport security scanners that can see through clothes or websites that report their browsing habits back to some corporate big brother. A Kinect sensor is designed to be placed above or below a TV, watching and listening to whatever is in front of it. The sensor plugs into an Xbox 360 and is used for controller-free playing of video games and both voice and gestural control of services running on your TV such as the watching of downloaded movies and sports broadcasts. Kipman said that the default setting for Kinect is to transmit no data it sees and hears to Microsoft. That cuts the company off from a trove of information the system can collect. The Kinect's microphones catch vocals, enabling voice command. They are even capable of speaker-specific recognition that distinguishes one person from another, though the feature isn't used much at Kinect's launch. Kinect's visual sensors, one for depth, another for colors and shapes, can detect the topographies of the bodies and living room in front of them as well as track the gestures of a simplified stick figure version of the user. The Kinect can track where your hands are, how your joints move and even be set up to recognize your face. The sensor is always listening for voice, as long as it is plugged into an Xbox that is turned on. It is looking for visual cues and tracking depth most of the time as well. A green light on the sensor illuminates top show it is active. And a grayscale box showing what it can see is rendered on your TV. These cues tell you you're being tracked by the sensor, so that you're never unaware that it is doing something, Kipman explained. At no time, Kipman stressed, will the Kinect ever send photos of users to Microsoft. "In some cases it will take some depth data but that depth data will be in a way we can't tell facial features or living room features." Kipman said that Kinect users will have the option to send some data to Microsoft, if they so choose. "You're going to be asked, 'Would you like to Kinect, in an anonymous way without anything relating back to you, to track your voice and your gestures?' You can say, 'Sure I want to make the system better.' Some amount of that data, particularly around troubleshooting, when things don't go right, will get sent up. We have a ton of infrastructure in the cloud to anonymize it. … That data we will look at... so we can figure out where our users are running into problems and then go out and get statistically significant data." The majority of data Microsoft collects, he said, will be gathered by the company's efforts to actively visit people's homes and run tests. That data, part of obvious and official trials, will be used by Microsoft to improve the Kinect's ability to work with various voices and room configurations and be passed on to Kinect owners via downloadable software updates that improve the firmware in the Kinect and Xbox machinery. 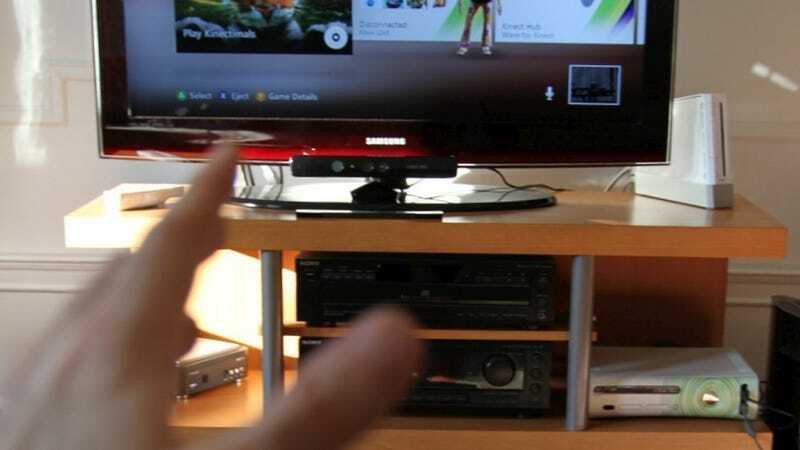 Kinect will allow a device hooked up to our TV to watch us. But Microsoft is vowing that it won't be a bothersome big brother.